Download "VEHICLE MANAGEMENT AND USAGE PROCEDURES"
1 VEHICLE MANAGEMENT AND USAGE PROCEDURES Section Contact Campus Facilities Regional Registrar Facilities Management - Manawatu Last Review February 2008 Next Review February 2009 Approval n/a Purpose: To describe the steps to be performed in the management and usage of University vehicles. Establishes the purpose of vehicle management and who is responsible for which actions. Communicates acceptable practice and sets boundaries around vehicle management and usage. Definitions: University Business: means any activity associated with the University. It includes activities such as teaching, research, administration, cultural and sporting activities. University Fleet: the fleet of vehicles owned or leased by the University and managed by Fleet Management. This consists of Pool Vehicles and Dedicated Vehicles. Pool Vehicle: a vehicle owned or leased by the University permanently located at the Fleet compound and available for booking on a daily basis by departments as required. Dedicated Vehicles: a vehicle owned or leased by the University assigned to a specific department and held by that department on a permanent basis, usually physically located at that department. Fleet Management: the Fleet Management offices located at Regional Facilities Management sections. Private Vehicle: a privately owned vehicle used by the driver for a particular journey for which expenses are reimbursed by the University. Rental Car: a car hired from a commercial rental company on a daily basis as required. University Vehicle: any vehicle used on University Business, consisting of Pool Vehicles, Dedicated Vehicles, Private Vehicles, and Rental Cars. Public Transport: includes train, airport shuttle, bus service and the like. Contracted Transport: a larger capacity vehicle such as a coach or mini bus hired from a commercial rental company as required. University Fleet: 1. Fleet Management Offices at Regional Facilities Management section are the University s sole management agency of the University Fleet. The specific responsibilities of the Fleet Management Offices are set out in the following section. The specific responsibilities of departments in relation to their Dedicated Vehicles are set out in the subsequent section. 2. Fleet Management Offices responsibilities in relation to Pool Vehicles and Dedicated Vehicles: Arrange for all petrol vehicles to be serviced every 15,000 kilometres and diesel vehicles every 7,500 kilometres or as manufacturers specifications. Arrange service bookings with appropriate approved service agency. Arrange delivery and pick up of vehicles to service agency. Book vehicles for Registration, WOF, RUC, CNG Certificates and the like. Arrange WOF, RUC, and CNG Certificates. Arrange WOF inspections. 2 Vehicle Management and Usage Procedures Page 2 Undertake periodic checks of tyres, brakes, batteries, lights, and so on and initiate rapid follow up of all reported defects. Maintain all Pool Vehicles in a clean and tidy fashion, internally and externally. Provide necessary data to the lease vehicle provider to ensure accurate records of all vehicle use, costs, and maintenance are kept. Provide assistance to vehicle users as necessary in the event of breakdowns and accidents and so on. Ensure the physical security of the University Fleet compound. Monitor and adjust if necessary the allocation of vehicles to ensure optimum vehicle utilisation. Ensure that Pool Vehicle allocation is fair, user friendly and organised to achieve high levels of customer service. Fleet Management Office to collate and report statistics on accidents and incidents occurred while driving on University Business and the causes of these accidents and incidents. 3. Specific responsibilities of departments in relation to their Dedicated Vehicles are as follows: Maintain all Dedicated Vehicles in a clean and tidy fashion, internally and externally. Undertake regular visual checks of the vehicle and report all defects and other concerns to Fleet Management promptly. Provide necessary data required by the lease vehicle provider, such as odometer readings, to the Fleet Management Office as required to ensure accurate records of all vehicle use, costs and maintenance are kept. Assist vehicle users as necessary in the event of breakdowns and accidents, working in cooperation with the Fleet Management Office. Take all reasonable steps to ensure the physical security of the Dedicated Vehicle. The alteration or fitting of accessories to Dedicated Vehicles is prohibited unless authorised by the Fleet Management Office in writing. 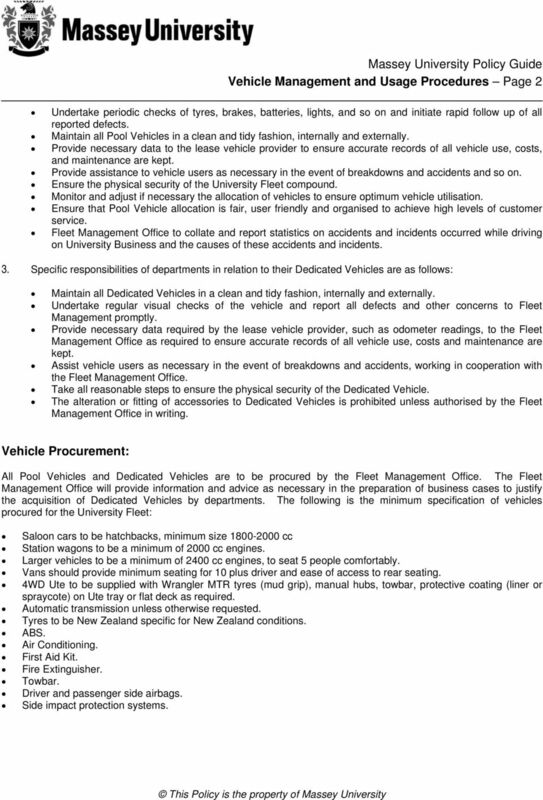 Vehicle Procurement: All Pool Vehicles and Dedicated Vehicles are to be procured by the Fleet Management Office. The Fleet Management Office will provide information and advice as necessary in the preparation of business cases to justify the acquisition of Dedicated Vehicles by departments. 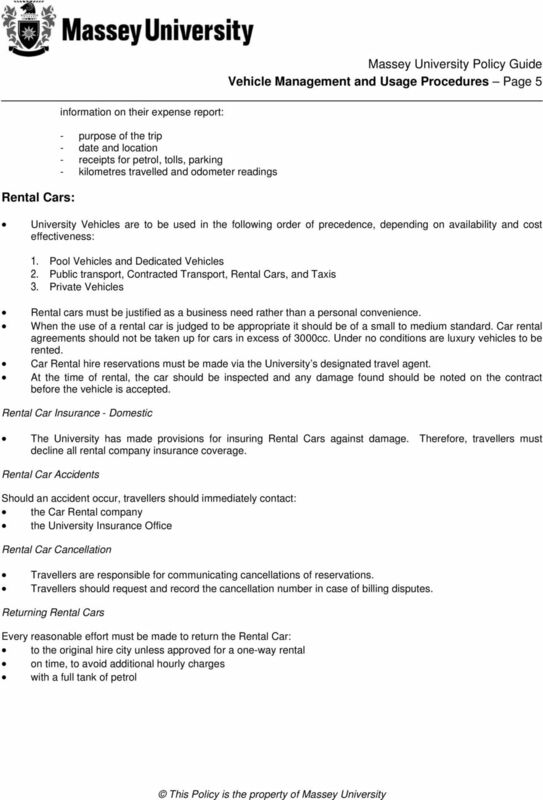 The following is the minimum specification of vehicles procured for the University Fleet: Saloon cars to be hatchbacks, minimum size cc Station wagons to be a minimum of 2000 cc engines. Larger vehicles to be a minimum of 2400 cc engines, to seat 5 people comfortably. Vans should provide minimum seating for 10 plus driver and ease of access to rear seating. 4WD Ute to be supplied with Wrangler MTR tyres (mud grip), manual hubs, towbar, protective coating (liner or spraycote) on Ute tray or flat deck as required. Automatic transmission unless otherwise requested. Tyres to be New Zealand specific for New Zealand conditions. ABS. Air Conditioning. First Aid Kit. Fire Extinguisher. Towbar. Driver and passenger side airbags. Side impact protection systems. 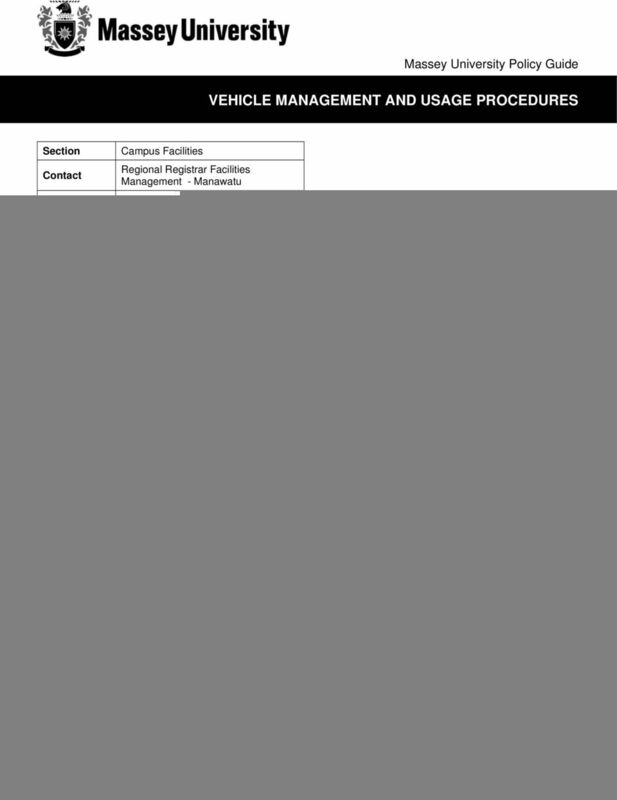 3 Vehicle Management and Usage Procedures Page 3 Dedicated Vehicles: Dedicated Vehicles may be allocated to departments upon approval of a suitable business case. The business case is to present a detailed financial analysis and a justification of need. Heads of Department and equivalent are responsible for the control of and operating of Dedicated Vehicles assigned to their department. A Dedicated Vehicle will not normally be supplied to a staff member on a permanent basis to enable them to carry out their duties unless this is stated in the approved business case. Written records of use and benefits to employees must be maintained. These records are to be submitted to the Fleet Management Office on a quarterly basis. 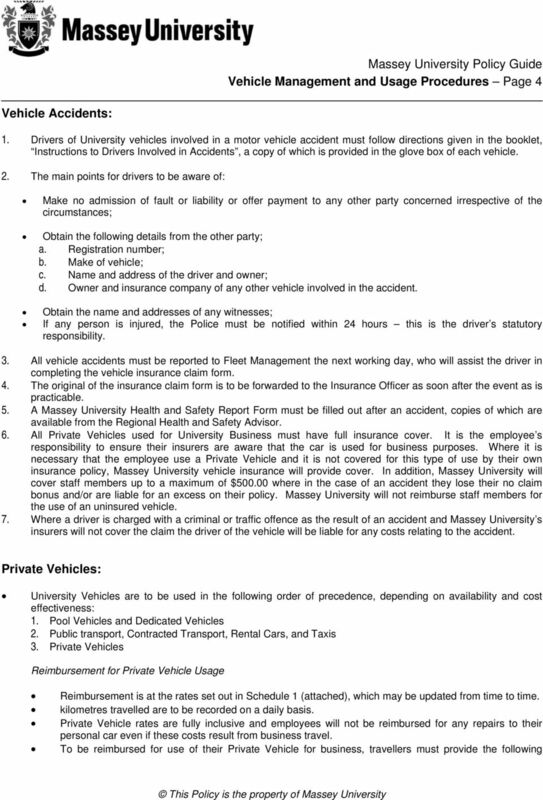 University Vehicles Generally: The driver of a University vehicle must operate the vehicle in accordance with all Acts, Regulations, and Bylaws relating to the operation of motor vehicles, and observe all traffic laws. The driver is personally responsible for all traffic violations and any resulting fines or penalties, which may lead to disciplinary action. All drivers and passengers must wear seat belts. All drivers of University vehicles must hold an appropriate driver licence and provide details of their driver s licence to Massey Fleet Management prior to being authorised to drive or operate University vehicles. The driver to whom a Pool Vehicle has been released is responsible for the security and operation of the vehicle until it is returned to the Fleet Management compound. The offering of rides to hitchhikers in University vehicles is prohibited. This does not preclude the rendering of assistance to people in difficulty or in an emergency that may require assistance. 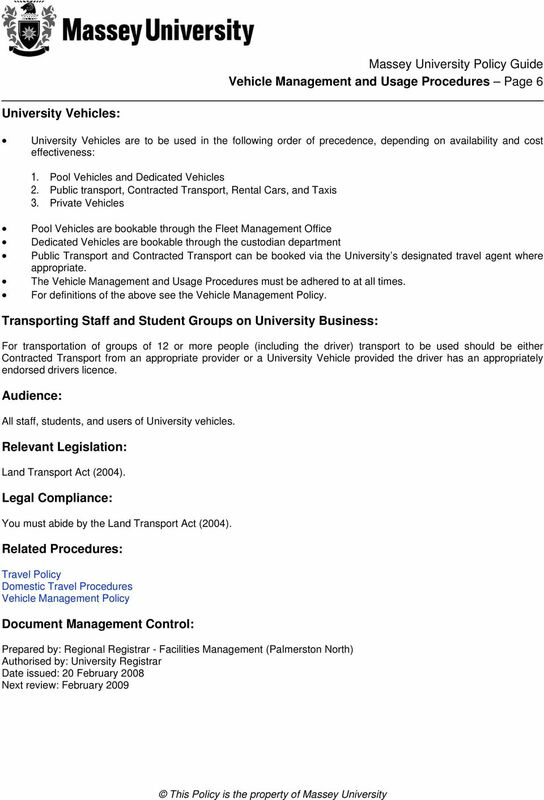 University vehicles are to be used for University Business only. For this purpose University Business excludes detours en route for private usage and overnight parking of vehicles at private residences. No smoking is allowed in University vehicles. Drivers of University vehicles are to switch their cellphones off or, where such feature exists, to switch it to flight mode. Pool Vehicles and Dedicated Vehicles are only to be refuelled at BP service stations using the Fleetcard provided in each vehicle. Transaction receipts are to be stored in the folder holding the Fleetcard. Odometer readings are to be provided when refuelling using the Fleetcard. Each Fleetcard is assigned to a specific Pool Vehicle or Dedicated Vehicle and may only be used to purchase fuel and oil for that vehicle. Fleetcards may not be used to purchase fuel for vehicles other than Pool Vehicles and Dedicated Vehicles or to purchase other items. 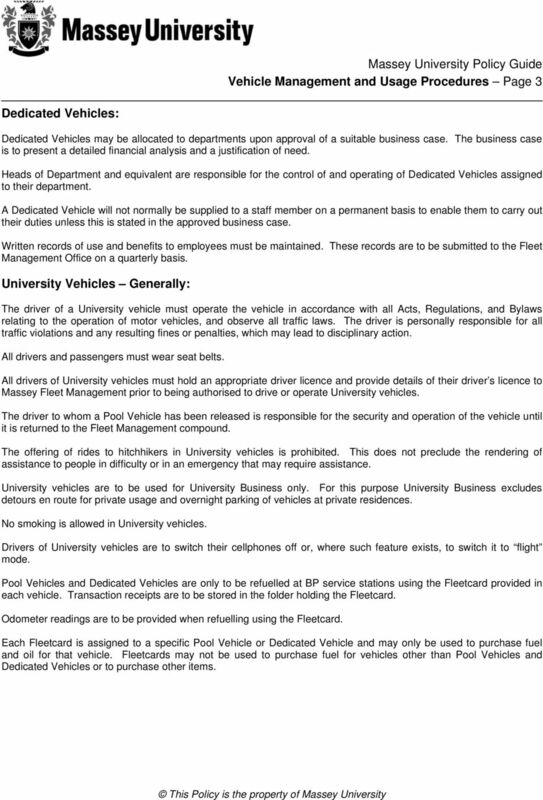 Page 1 UNIVERSITY OF MOUNT UNION FLEET VEHICLE POLICY UPDATED: February 2014 The University of Mount Union maintains a fleet of vehicles that are available for University-sponsored activities and functions. Minibus Policy. The Trust has several minibuses available ranging from seven (7) to seventeen (17) seats, all with standard seat belt restraints. car MEMBERSHIP MANUAL If applying for membership you must read and understand all of this Manual before signing the Membership Application. Fleet Services - Frequently Asked Questions (FAQs) Repair/Maintenance Accident Procedures Pin Questions Proper Use of City Vehicles Insurance Motor Pool Vehicle Replacement General Repair/Maintenance Q. SAMPLE POLICY ON THE USE OF COMPANY VEHICLES. 1. Purpose: To set out policy of The Company with regard to the use of company vehicles. THE CHARTERED INSURANCE INSTITUTE. Read the instructions on page 3 carefully before answering any questions.